14 cyclists, all men, represented Italy in 1960. 20 fencers, 15 men and 5 women, represented Italy in 1960. 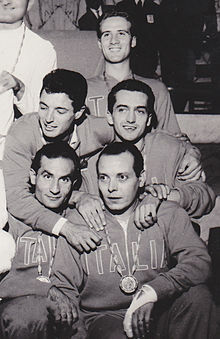 Three male pentathletes represented Italy in 1960. Italy had 26 male rowers participate in all seven rowing events in 1960. 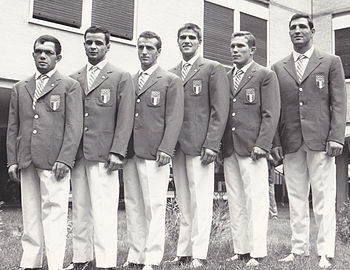 Nine shooters represented Italy in 1960. ^ "Italy at the 1960 Rome Summer Games". sports-reference.com. Archived from the original on 4 August 2014. Retrieved 30 July 2014. ^ Evans, Hilary; Gjerde, Arild; Heijmans, Jeroen; Mallon, Bill. "Italy Rowing at the 1960 Roma Summer Games". Olympics at Sports-Reference.com. Sports Reference LLC. Retrieved 26 February 2018. This page was last edited on 28 March 2018, at 19:37 (UTC).